I received the following email from Monica Bessette, who has graciously shared pictures of her well-loved Izannah doll with us. 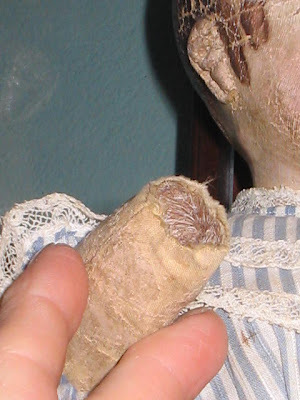 I find these well-loved dolls very interesting, because you can often see more about the construction of the dolls because of the wear. Here's the email, and pictures following. Monica has said she will share some additional detailed pictures as well. Thank you, Monica! Well, I missed the end of the month, but here I am. 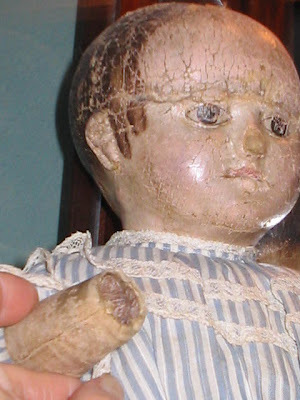 Attached are some photos of my Walker doll that I named Joy. Her namesake is Joy Kelleher, of Special Joys Bed & Breakfast in Coventry, CT.
Joy Kelleher was instrumental in bringing me together with Maurine Popp, one of the the premier Izannah Walker collectors of our time. Back in 1998, just prior to the publication of my article, Walker Dolls: A Family Business, Joy invited me to speak to her doll club's upcoming meeting. 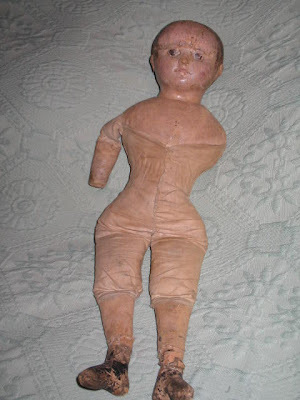 The meeting was to be held in her doll museum, which was then part of the Bed & Breakfast. I jumped at the chance to speak in this intimate venue, but I wasn't prepared for the surprise guests and the wonderful response to my research. I had always wanted to meet Maurine Popp. 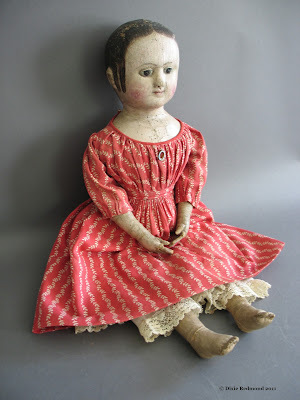 Her comprehensive collection of Walker dolls, which she was collecting in the 1960's or even earlier, were some of the first I had ever seen in print, as she was always very generous in sharing her collection in books and magazines. 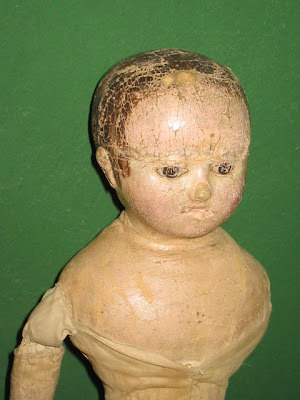 We can all thank Maurine for bringing these fascinating dolls to the attention of collectors. Not only did Maurine Popp come to my slide lecture at Joy's invitation, she also brought two of my favorite Walker dolls with her to display. Since we were both staying at the bed & breakfast the night of the meeting, I was able to have a personal chat with her and Joy over tea beforehand. 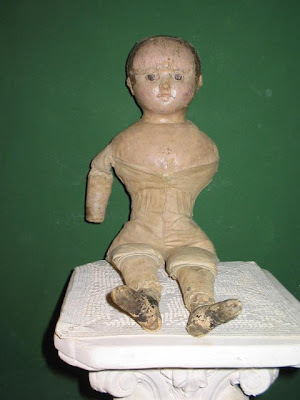 Six years later, when Joy decided to sell part of her museum collection, I took a chance and called to see if there was any way she would consider selling me her Walker doll. She said she'd give it some thought, but I didn't think I had a chance. 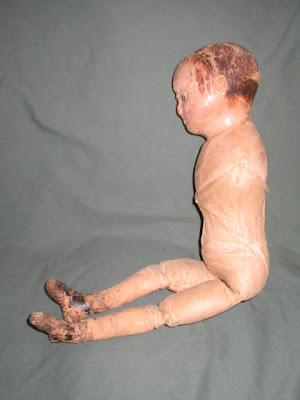 About two weeks later, I received an email from Joy playfully asking if I knew anyone who would consider purchasing an old rag doll with missing limbs and cracks all over her face. I was overcome with emotion. Could this be true? 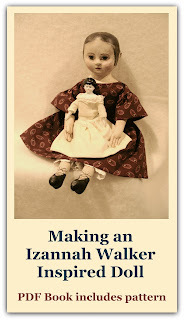 Would I actually have an Izannah Walker doll of my own? After I stopped crying, I called Joy to thank her for her kind offer and make arrangements to pick up the doll--the next day before she changed her mind!. Included is a photo of me on that day, and you can see that I'm a little disoriented holding my new treasure. 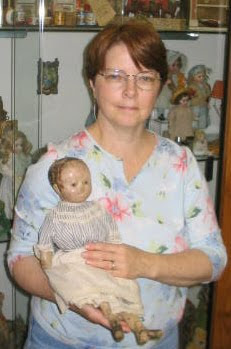 Joy Kelleher has given me so much pleasure in her friendship and her confidence in my research, that I immediately named the doll after her so I would always be reminded of her and the special times I've spent in her bed & breakfast and museum, which is now her shop. 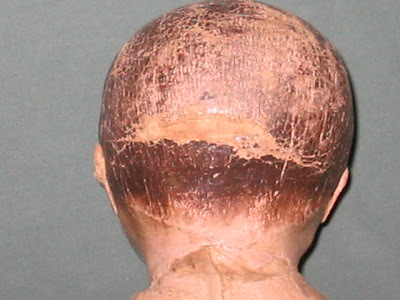 I've included photos of different angles of the doll. One photo is interesting in that it shows that the arms were stuffed with hair. It's probably horse hair, since that was plentiful in Izannah's early Central Falls neighborhood, but it's hard to tell exactly. 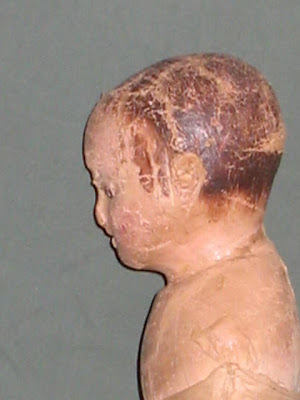 You can see from the full side view that the body was sewn together and then the arms were attached at the shoulders. 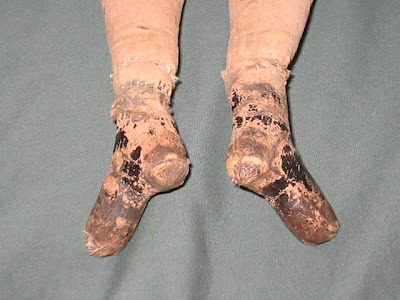 She's 18 inches tall and has the typical repaired breaks in the mid-calf area of the legs. She's in rough shape, but I couldn't love her more than I do. The arms appear to be stuffed with horsehair. Wow!!!!!!! OMG! That is awesome, Monica!!!!!!! Thank You for sharing with Dixie and us all!!!! You are to kind!!!!!!! And one lucky Chicky!!! 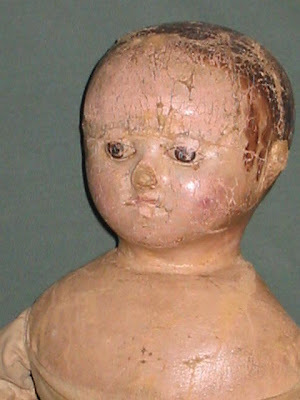 Did you post a pic of the top of Monicas doll head, looking down at the eyes? Or did i just dream about it?